The following article is an unedited version of the article published in Edition #426 of ‘The Big Issue‘ magazine. NB. This article contains references to Aboriginals who have died. With a state election looming in Western Australia on 9 March, Charlie Sublet travels to an area of The Kimberley that is under threat from a proposed Liquefied Natural Gas processing plant. It’s 6am and I’m sitting on the dunes overlooking the vast Indian Ocean as it continues its ceaseless roll to shore. Morrning Glory, a wild vine with medicinal properties winds across the earth. 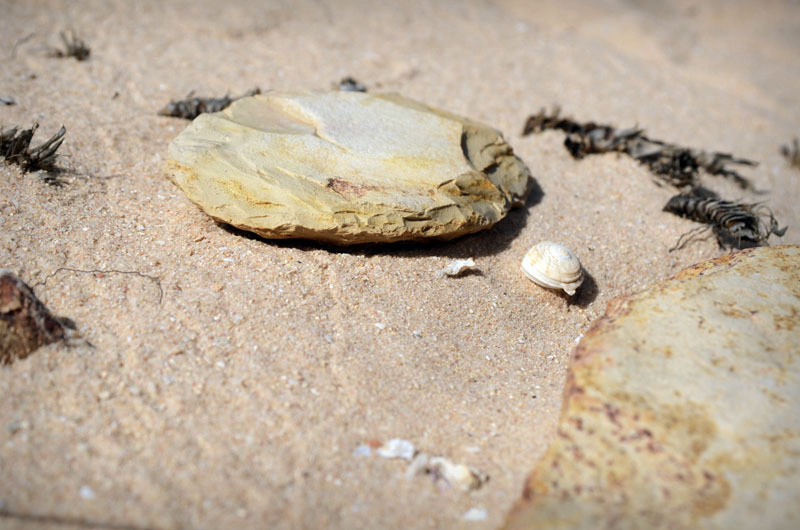 Jagged rocks, burning amber under the rising sun, litter the beach. Welcome to Walmadan, an ancient and special place lined up for imminent destruction. Walmadan (aka James Price Point) is a sacred Aboriginal area on Australia’s north-west coast, 50km north of Broome. It makes up part of the vast and pristine Kimberley region, one of the world’s last great wilderness areas. 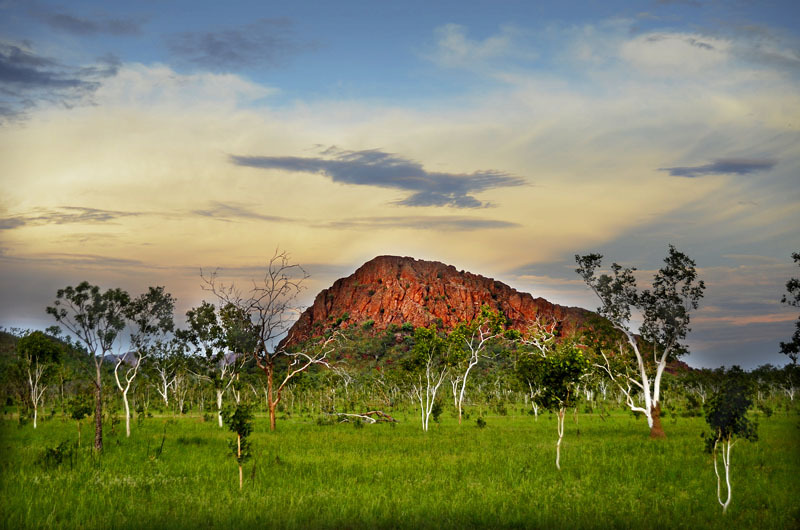 Named after the warrior, Walmadany, who fiercely protected his people against invaders, Walmadan is home to the Goolarabooloo Jabirr Jabirr Aboriginal peoples, the area’s traditional custodians. It sits on a songline – a continuous source of spiritual, cultural and physical sustenance. Sixty-three days living in a van and 8460 km via a rambling route from Melbourne leave me here in this critically endangered place. I came because I had to, struck by a profound realisation that left me sleepless for five nights. The realisation was more ‘felt’ than rational, what some aboriginal people refer to as ‘lian’ (gut feeling). And perhaps it also reflected their belief that one’s relationship to the earth is reciprocal. There is, however, a proposal by WA Premier Colin Barnett to build Browse LNG, the world’s largest Liquefied Natural Gas (LNG) processing plant, which will destroy this songline and affect the entire Kimberley region. The plant (a joint venture involving, among others, Shell, BP and PetroChina) would cover approximately 25 square kilometres, require dredging of 34 million tonnes of seabed in a humpback whale calving area, involve 8000 workers and increase the state’s greenhouse gas emissions by 50%. It will tear apart the environmental, cultural, and social fabric of the region. Even so, Barnett has described the plant as simply “a giant refrigerator” (Q&A, ABC TV, 5 Nov 2012) and he has made his long-term intentions clear: the Kimberley will become the state’s mining hub for the next 50 years. ‘Iron-Ore Loading Yard’, 2012. 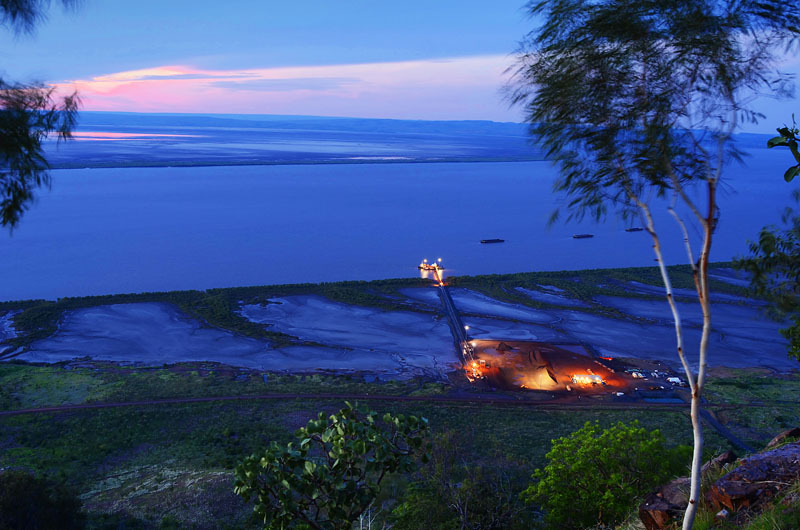 The Kimberley Metals Group Loading Yard at Wyndham, NE Kimberley; Inappropriately set in a sensitive mangrove and mudflat ecosystem. A recent New York Times article listed the Kimberley as one of the world’s top destinations, while also noting the grave threat from mining. If this proposal is passed, the resulting port will provide a massive incentive to mining corporations to enter the region. In the past decade there has already been a 500% increase in mining applications here. This is a matter of international significance, like the ‘No Dams’ Franklin campaign of the 80’s which fortunately resulted in that hidden gem being saved and listed as a United Nations World Heritage Area. The Kimberley is extremely rich in environmental and cultural elements, including geological wonders such as the Bungle Bungle, wild rivers, rainforests, pristine coastline, extensive rock art and incredible wildlife. In the northern Kimberley, unlike anywhere else in Australia, there are no recorded mammal extinctions, and new species of flora and fauna are continually being discovered. 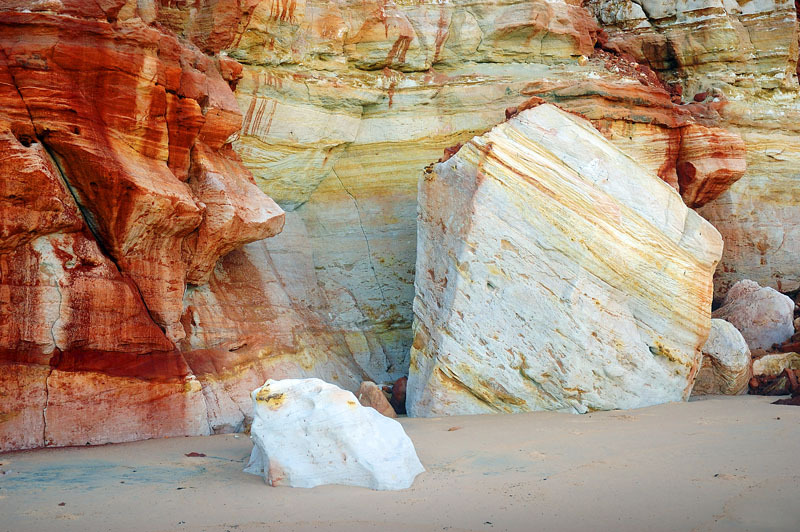 The Kimberley’s beauty and significance go way beyond the visual and verbal. It is profound. It contains a space that enables one to fully relax and to experience a connection to something far, far greater than any of us. There exists a deep sense of belonging and calm in its wildness. ‘Iron Mountain’ 2013. Savannah Grasslands of South Central Kimberley. Twenty-five years ago, Aboriginal elder Paddy Roe created the 82 km Lurujarri Heritage Trail, which runs through Walmadan. It was Roe’s vision to share his culture and heritage with non-Aboriginals to foster understanding and reconciliation. Thousands of people have since walked this trail. Roe, now deceased, received an Order of Australia Medal, yet his legacy and many of his ancestors’ graves are at serious risk of being desecrated. Woodside were recently given approval to “excavate, destroy, damage, conceal or in any way alter” the area despite it being recognised under the Aboriginal Heritage Act. Imagine a similar activity at sacred graves of Anglo-Australians – war hero Weary Dunlop, perhaps, or sporting legend Don Bradman. It wouldn’t happen. If the project goes ahead, the trail, Walmadan and the songline will be destroyed. A songline is a continuous living cycle that cannot exist in divided physical parts. 40,000 – 60000 years of sustainable and ongoing existence, and millions of years of environmental creation, would be destroyed for Barnett’s grand FIFTY-YEAR VISION – to see The Kimberley region become the industrial backbone of WA. Camping at Walmadan for a week, I discovered it is not the “unremarkable piece of coastline” that Barnett claims it to be. His description stinks of cynicism and ignorance. He’s trying to pull the wool over the Australian public’s collective eye by exploiting the fact that the area is relatively unknown due to its remote location. It is reminiscent of the past Tasmanian Premier, Robin Grey, who described The Franklin River as a “leech-ridden ditch”. NB. Post his political career, Grey became director of Gunns Ltd (famous for wood-chipping Tasmania’s old-growth forests). Walmadan is overflowing with life and culture. I encountered white-bellied sea eagles, goannas, snakes, petrified trees, infant coral reefs, dinosaur footprints, and a plethora of intertidal sea-life. I walked with traditional owner and law boss Phillip Roe (grandson of Paddy), who pointed out remnant grinding stones, axe heads, red ochre, sea turtle bones, human bones, ancestral graves, middens, and numerous plants providing bush tucker and medicine that helped sustain the world’s oldest living culture for aeons. The environmental and cultural wealth at Walmadan is anything but unremarkable. ‘Remnant Stone Axehead’ 2013. Walmadan (James Price Point). There are two alternative options that would save the environment, culture, community AND money. A Citigroup analysis stated it would be $15 billion cheaper to pipe the gas to existing infrastructure in the Pilbara. And the option of offshore processing on a floating LNG plant would save $9 billion. Yet Premier Barnett continues to demand that it go ahead at Walmadan and is now actively campaigning against the floating facility. There is a seeping stench of an unrestrained ego desperate to be remembered for industrialising The Kimberley. In addition to these issues, there exists a growing list of unethical and possibly illegal practices. Of major concern is the action taken by the WA Environment Protection Authority to change a regulation to enable the EPA Board to make decisions even if only one board member is eligible. When Woodside’s proposal was then submitted, four of the five board members withdrew due to conflicts of interest, and the one remaining member approved the proposal last July. Traditional owner Richard Hunter and the Wilderness Society of WA are challenging this in the courts. With the state election approaching, the main parties have detailed their positions: Barnett’s Liberal Party is steadfast in his mission; Labor wants Walmadan to be the development site but is willing for the gas to be piped to the Pilbara; the Greens are the only party entirely opposed to the Walmadan option. Woodside is obliged to make a final decision by 30 June. Walmadany the Warrior once protected his people and the songline. Now it is up to the people of Waldaman, and beyond, to safeguard the Kimberley from the exploitative hand of new invaders. 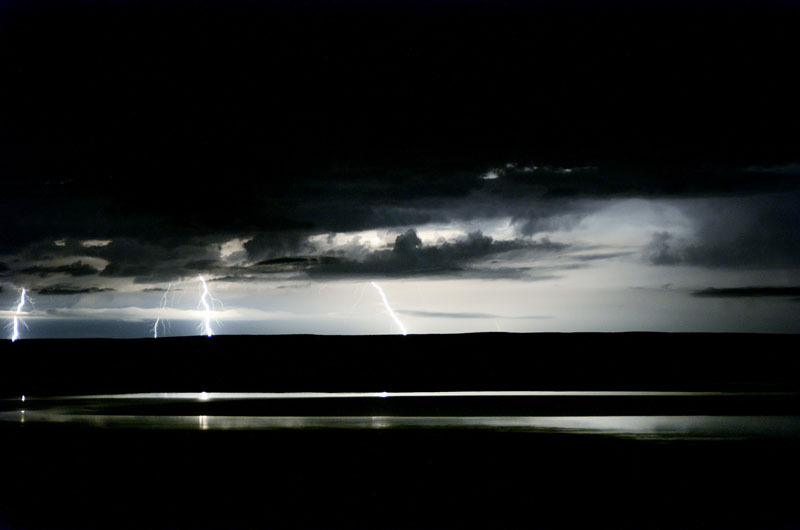 ‘Electrical Storm’, Cambridge Gulf, Wyndham, Dec 31, 2012 @ 22:52. To view exhibition works by photographer, Hunter G, and hear an inspirational speech about The Kimberley by environmentalist and ex Greens Party leader, Bob Brown , visit Hunter G’s blog. And for more up-to-date information about ongoing attempts to industrialise The Kimberley, visit environskimberley.org.au, broomenogas.org and goolarabooloo.org.au. Addendum: While concerned by some significant editorial changes which appeared in the published version (due to commercial ‘concerns’ from The Big Issue’s WA Office), Charlie Sublet is grateful to The Big Issue for publishing this piece at short notice. Charlie has always chosen to supply his images and text to The Big Issue instead of any other magazines/newspapers because of The Big Issue‘s focus on social issues and its relative lack of offensive commercial advertising which can be found all through most magazines, newspapers, TV and radio stations. Thanks to Hunter G for the use of his images.